For eliminating hum and buzz in line-level signals, Faraday-shielded input transformers are the preferred solution. 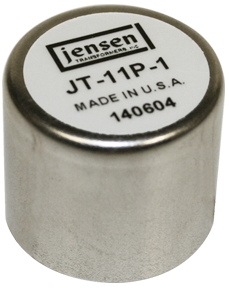 These transformers offer extended low-frequency and Bessel-tailored high-frequency responses, resulting in ultra-low time-domain distortion (DLP), and use internal Faraday shields for unmatched immunity to hum, buzz, and RF interference (high CMRR). Transformer-less inputs suffer “breakthrough” noise in electrically-hostile environments but transformers are unaffected. The controlled high-frequency response removes ultra-sonic “hard digital edge” artifacts from signals, resulting in a unmatched sonic clarity. Each transformer is enclosed in a MuMETAL® magnetic shielding can to reduce hum caused by any nearby magnetic fields. Several turns ratios are offered to optimize noise performance with various input stage designs. Extremely high dynamic range can be delivered, up to 140 dB, in real-world system environments.